Electronic temperature measurement with resistance sensor or thermocouple sensor. Ex barrier for temperature sensors, potentiometers and current/voltage signals. Conversion of current signals from supplied transmitters to 2-wire 4-20mA signals. Conversion of linear resistance variation. Galvanic isolation of analogue signals. Linearisation of non-linear Ohm, mV, mA, or voltage signals. The transmitter is configured to the present task by way of a PC and the Loop Link interface. The transmitter can be configured with or without a connected supply voltage as the communications interface supplies the necessary voltage to the set-up. The communications interface is galvanically isolated to protect the PC port. Communication is 2-way to allow the retrieval of the transmitter set-up into the PC and to allow the transmission of the PC set-up to the transmitter. For users who do not wish to do the set-up themselves, the 5131 can be delivered configured according to customer specifications: input type, measurement range, sensor error detection, and output signal. If you require, Omni Instruments can program the unit before shipping to your specific applications. Please send us a completed Configuration Form below and send it to us. Note: For TC inputs with internal CJC, remember to order the CJC connectors type 5910 / 5910 EEx (ch. 1) and 5913 / 5913 EEx (ch. 2). If required, Omni Instruments will program a 5131 to your specific requirements. Please contact us for details. Single channel 2-wire programmable transmitter with a 7.5-35vDC power supply. Please specify the required inputs RTD, TC, R, mA, mV or V. Output 4-20mA. Dual channel 2-wire programmable transmitter with a 7.5-35vDC power supply. Please specify the required inputs for each channel RTD, TC, R, mA, mV or V. Output 4-20mA. Single channel 2-wire programmable ATEX transmitter with a 7.5-35vDC power supply. Suitable for RTD, TC, R and mV Input and 4-20mA output. Dual channel 2-wire programmable ATEX transmitter with a 7.5-35vDC power supply. Suitable for RTD, TC, R and mV Input and 4-20mA output. 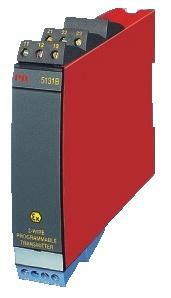 Single channel 2-wire programmable ATEX transmitter with a 7.5-35vDC power supply. Suitable for mA, V and mV Input and 4-20mA output. Dual channel 2-wire programmable ATEX transmitter with a 7.5-35vDC power supply. Suitable for mA, V and mV Input and 4-20mA output. Dual channel 2-wire programmable ATEX transmitter with a 7.5-35vDC power supply. Dual channel, first channel suitable for RTD, TC, R and mV and second channel for mA, mV and V Inputs.